My Nail Polish Diary: Versatile Blogger Award Nomination! 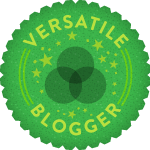 So, I was nominated for a blogger award by Heidi at DIY Polish & More for the Versatile Blogger Award. I am really honored. In the big world of bloggers is quite the honor to have someone notice you and especially wonderful they think you're worth of an award nomination. Thanks Heidi! 1. I have been interested in nail polish and the entire beauty industry since I was 8. 3. DH and I recently bought a house and we're in the process of remodeling and making it our own style. 4. I have 1 amazing son. 6. I design dog dresses and I'm starting my own company to sell them. 7. I recently moved from San Francisco back to the East coast. So that's it. Thanks Heidi for nominating me!